← DARPA Needs Your Help! Design A Ground Combat Vehicle. Pure win. 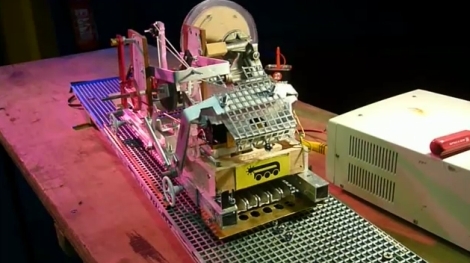 Most Turing machine builds I’ve seen use an actual von Neumann computer to implement the state change mechanism. Love the project, hate the title. Im sure even this awesome project is limited to turing computable problems. If this is not the case, you have a millenium prize coming your way. Awesome!! no electrics involved! w00t!! But only a few comments? wtf? What’s not to love? Does it have to inapptopriately include a fisher-price uC to get ppls attention? excellent! its good to see this working after seeing it at various states of build/teardown in the London Hackspace! Now, Turing complete will suffice. And this device certainly seems to do the trick. Very cool implementation I might add. The “non-infinite size and lifespan” is usually taken as a given when people make Turing machines. now the only thing it needs is a series of lego men glued to it with hard lab coats. An excellent project showing a very high degree of originality and electro-mechanical knowledge. Well done indeed!